Winter was the favoured season for staff movements, making travelling much easier because of the down time. 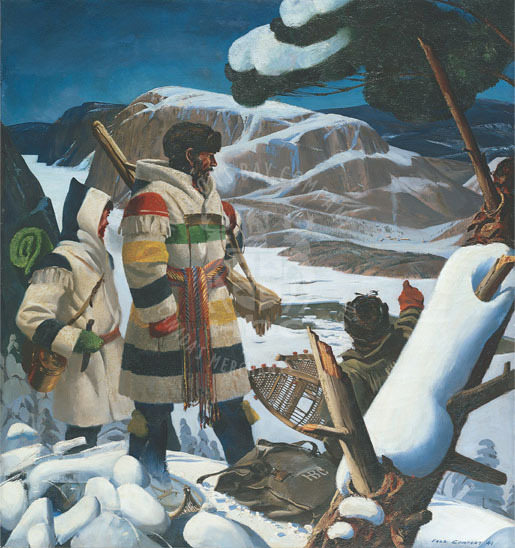 This painting depicts three traders arriving at the Hudson's Bay Company trading post of Tadoussac, their new assignment. The central figure is Chief Factor George Barnston. R.M. Ballantyne is the figure on the left carrying the copper kettle and green blanket. In the last period of his employment with HBC, Ballantyne started to write a journal. Although his intent was to describe his experiences to his mother, "The Record", as it was called, ultimately led Ballantyne to what would become his life's work. His novel, Hudson's Bay or The Life in the Wilds of North America, which recounts his youth and adventures during his seven-year employment with HBC, was published in 1848. What does R. M. Ballantyne look like? Zoom in on the image and look closely... can you find the copper kettle? Check the Beaver Index - e.g., type in snowshoes, capotes, Ballantyne, etc.